NXPowerLite portable radically reduces the size of PDF, Word documents, Excel spreadsheets, PowerPoint presentations and JPEG images. Files remain in their original format, with no discernible loss of quality – and there’s no need to unzip before using them. It’s incredibly easy to use. Simply select a file, choose your optimisation level and click the ‘Optimise’ button. If you use Lotus Notes, Microsoft Outlook, Outlook Express or Windows Mail, it’s even easier. 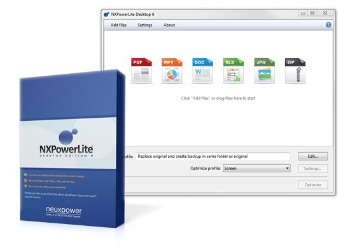 NXPowerLite Desktop Edition will automatically optimize email attachments as they are sent. File recipients don’t need NXPowerLite to open or edit the attachments. Create unlimited personalised profiles with custom resolution, quality, hidden data settings and more. Quickly select any settings profile straight from the home screen for a great productivity boost. NXPowerLite can automatically compress your email attachments as they are sent in either Outlook or Lotus Notes.